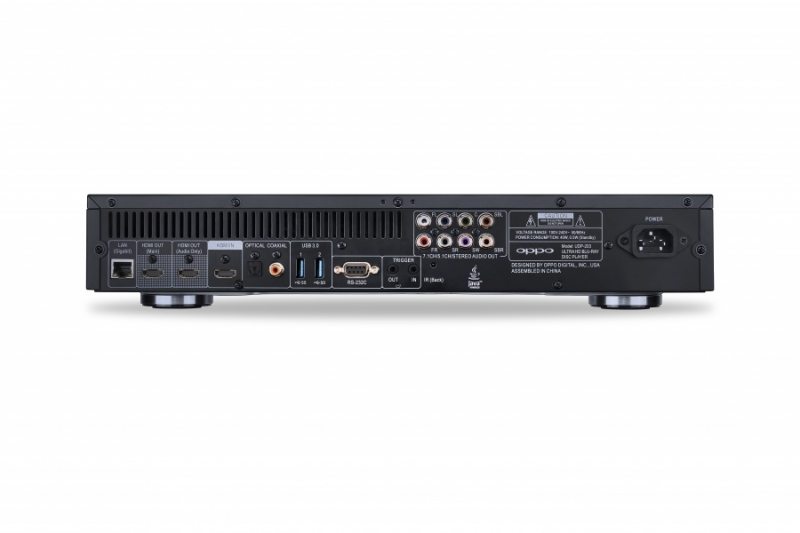 Audiocom 203 Reference Edition - Reference 4K UHD Blu-ray Player, Linear Power Supply for Audio & Video Circuitry, 137 fs Jitter Clock for OP8591 SoC. Multi-Zone Blu-ray & Region Free DVD! OPPO BDP-203 Audiocom Reference is a high-end 4K UHD native Blu-ray player that delivers outstanding performance from video, HDMI digital audio (including optical and coaxial outputs), as well as delivering exceptional sound quality from analogue audio. 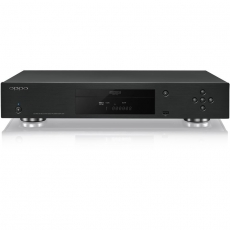 The 203 Reference takes full advantage of the OPPO’s powerful quad-core image processing and builds on this platform by incorporating a custom version linear power supply, a femtosecond clock system, improved disc read accuracy, and circuitry housed in a quiet mechanical and electrical environment. Traditional 4K Blu-ray players use a switch mode power supply (SMPS) since it is cost effective and easy to implement. However SMPS are noisy due to the high frequency switching, and this is manifest by noise on the power supplies as well as RFI/EMI noise. The 203 reference uses a custom linear power supply with multiple regulated supplies to delivery clean power to the video and audio circuitry. All spectrum of the players performance is considerably improved. Video playback has better resolution, greater depth, more detail, natural contrast, reduced picture noise, colour purity and improved image stability. There is a marked improvement in digital and analogue audio, with better resolution, greater dynamics, improved sound-staging, and more natural harmonics. It is widely recognised that low jitter clocks improve performance for audio, but less recognised is that low jitter is vital to achieve the best performance for video. For 4K Blu-ray players the clock jitter in video signal processor can be anywhere from 100-300 picoseconds inducing a reduction of picture quality and sound. In the 203 Reference player we utilize a custom, very low jitter clock for the OP8591 System on Chip with a jitter performance of 137 Femtoseconds ( 0.137 Picoseconds). As a result, picture quality is more natural with a cleaner, better defined image, digital and analogue sound is more dynamic, detailed and coherent. We discovered during disc playback that reducing interference fields and resonances in the disc transport could improve the performance of video and audio quality. For the 4K disc loader we apply a specialist material layer coating developed to absorb electromagnetic (RFI/EMI) energy, and cancel out unwanted resonances. The result is improved disc read accuracy, with improved colours and textures for a more realistic picture quality. The operating conditions of video and audio are much improved when they can work in quiet environment. Inside any Blu-ray player the video processing generates its own noise as well as succumbing to external noise which can affect the players overall performance. To achieve the quietest electrical conditions, in the 203 reference we use materials to shield and absorb the unwanted EMI/RFI and mechanical energy to achieve constantly the best performance regardless of the surroundings. ■ New custom linear power supply with multiple low noise regulated power supplies for video and audio circuitry. ■ New audio grade Cryofuse, non-magnetic, anti-resonance. ■ Vastly improved, error and jitter free data processing thanks to 137 Femtosecond Reference clock (0.137 psec) for OP8591 SoC (Video, digital audio, DAC input). ■ 4K disc loader modifications for improved disc reading accuracy. ■ New high quality Furutech IEC inlet with UP-OCC internal wiring to power supply. ■ New RFI/EMI shielding for HDMI outputs /Input. ■ New material layer coating for chassis that uses piezoelectric damping and absorbs electromagnetic (RFI/EMI) energy.